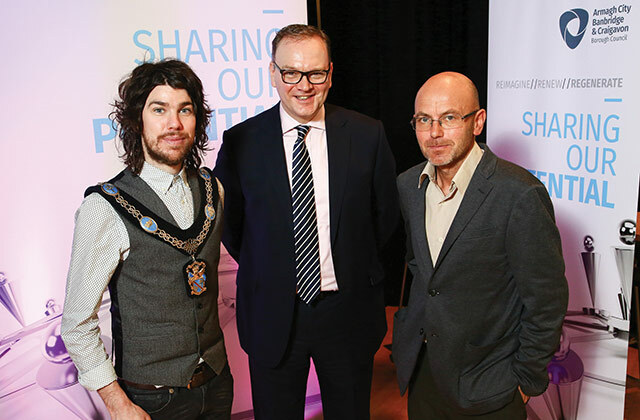 Lord Mayor Councillor Garath Keating, Chief Executive Roger Wilson and entrepreneur Wayne Hemingway MBE at the Sharing Our Potential Conference. As an ambitious and forward thinking local authority, Armagh City, Banbridge and Craigavon Borough Council is exceeding its own challenging ambitions enabling the ongoing regeneration of urban and rural areas. International designer, entrepreneur and broadcaster Wayne Hemingway MBE led a stellar speaker line-up at Council’s first regeneration conference. 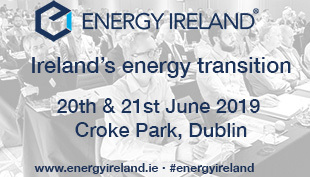 The event attracted strong interest from company directors, developers, planners, policy makers and investors keen to explore the opportunities available in the area. Hemingway and the panel of leading business experts, regeneration and heritage specialists, shared their insights and expertise on regeneration and place shaping for the future and how these can deliver real benefits for the region’s towns and cities, their communities and the economy. Hemingway said: “It is vitally important that Council, as a community leader, has a clear vision and set of plans and priorities to support its development and regeneration work. “We are in a fast-paced and constantly evolving world and it is more important than ever to be aware of great examples of placemaking that inform the ability to create inspiring and accessible places, where people want to live, work and spend their leisure time. Other experts included CBI Northern Ireland Chair David Gavaghan, formerly Chief Executive of Titanic Quarter Limited, distinguished speaker and urban planning expert Debra Mountford from the Organisation for Economic Co-operation and Development (OECD) and Dr Steve Millington from Manchester Metropolitan University’s Institute of Place Management. Delegates explored topics such as heritage-led regeneration, rural regeneration, customer trends in town centres, capital and infrastructure development, and how these can deliver real benefits for the region’s towns and cities, their communities and the economy. Council is building on the considerable built and natural heritage assets within the borough including the Heritage Lottery funded Townscape Heritage initiatives in Armagh City, Lurgan and Richhill, which have a potential combined value in the region of £10 million. These schemes will preserve the historic built form of these conservation areas, while enabling investment and re-use of vacant properties. A range of education and engagement projects will be delivered alongside the physical works planned. Together with the Department for Communities, Council has also invested in the region of £220,000 in a former Pump House building on the banks of the River Bann in Portadown. The building is part of the town’s industrial heritage and has been restored and extended with a view to securing a hospitality use such as a café/bistro. 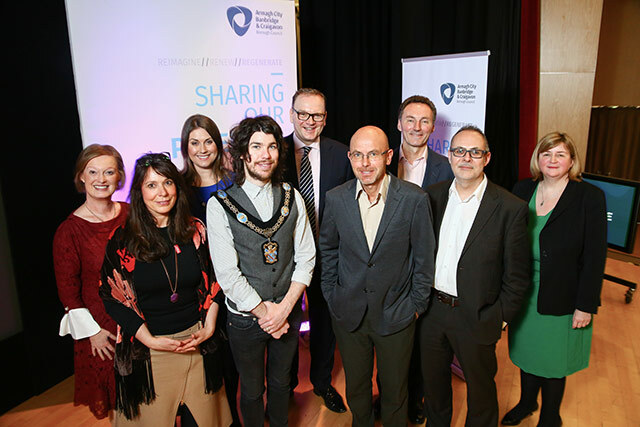 Therese Rafferty, Head of Regeneration; Debra Mountford; Sarah Travers; Lord Mayor Councillor Garath Keating; Roger Wilson, Chief Executive; Wayne Hemingway MBE; David Gavaghan; Dr. Steve Millington and Olga Murtagh, Strategic Director Place. A number of schemes continue to upgrade the public realm of urban centres within the borough. With the Department for Communities, Council has recently completed £5 million of improvement works in Lurgan town centre, and has started work on the ‘Portadown Linkages’ project which will deliver a further £2.5 million of investment in streets and spaces around the town centre. A programme of investment is also planned along the River Bann corridor, which will improve access and enhance recreation and leisure opportunities. In Keady and Richhill, work is well advanced on over £2 million of environmental improvements transforming the streetscape of these traditional rural villages. Plans are also being developed, in partnership with the Department for Communities, for a number of streets in Banbridge which will see an investment of over £2 million over the next two years. In central Craigavon a number of projects are being developed that will reinvigorate the streets and spaces of this unique urban centre, including a £200,000 upgrade of one of the footbridges constructed during the early stages of the ‘new town’ project. In line with the Banbridge Masterplan, work will commence shortly on a scheme to improve connections between the town centre and the recently developed bus station. A further programme of public realm improvements is also planned for Market Square and Bridge Street in the heart of Dromore, connecting the town centre with the river Lagan and enhancing the town’s historic core. The character of rural areas in Armagh, Banbridge and Craigavon is diverse and varied, from the Orchard County to Navan Fort, and from the scenic shores of Lough Neagh to the Newry and Portadown Canal. Over 100,000 people live in the rural area, making up almost 48 per cent of the borough’s population. Council is committed to effective engagement with our rural towns, villages and settlements, empowering them to develop a shared vision for their local area, offering improved local services, rural jobs, strong transport links, and digital accessibility. Measures are now in place to address social inequalities by regenerating communities, ensuring there is access to services, while fostering a progressive, dynamic and sustainable third sector that contributes to building good relations, cohesion and equality. Council continues to work in partnership with key government departments including the Department for Communities and is currently delivering an £8 million rural development programme in partnership with Department for Agriculture, Environment and Rural Affairs. Council is keen to play a strategic role in rural affairs ensuring that rural proofing is paramount to the development of all new strategies, policies and delivery of services. Working closely with the Department for Communities, council is developing innovative responses to the challenges faced by our urban centres and is currently delivering schemes focused on town centre gateway signage, shopfront improvements, and ‘meanwhile uses’ for vacant properties. An evening economy strategy is also being prepared, with a range of promotional campaigns planned for city and town centres throughout the borough. Council marked a new milestone by attending the UK’s largest investment and property event, MIPIM UK, with hundreds of delegates from across the property and investment sector. Hosting a series of meetings and networking events, council representatives met with national and international investors, stakeholders and interested parties, raising awareness of the borough’s investment strengths, successes and developments earmarked for potential regeneration. As outlined, the work of regeneration varies greatly but one statistic that stands out is that through regeneration Council is investing and attracting investment from grant funding and the private sector of £20 million by 2020. £20 million by 2020, that statistic is worth repeating.